In the 1930s, tens of spherically shaped stones were discovered in the jungle of Costa Rica. The stone balls were found by workers who were clearing a jungle area for banana plantations. They did not know what the objects were and almost 80 years later we still don’t know. The balls were found in the delta of Terraba River, near the towns of Palmar Sur and Palmar Norte. Almost immediately after their discovery, the balls were dispersed throughout Costa Rica. They were transported by train and landed up in different markets where people would buy them as lawn ornaments. A couple of them can be seen in the U.S., at the museum of the National Geographic Society in Washington and in a courtyard near the Peabody Museum of Archaeology and Ethnography at Harvard University in Cambridge, Massachusetts. Some stone balls have definitely been loaded in the wagons with difficulty. All present the same shape, spherical, but their sizes differ from small examples no bigger than tennis balls to some 2 meters high and weighing almost 16 tones. 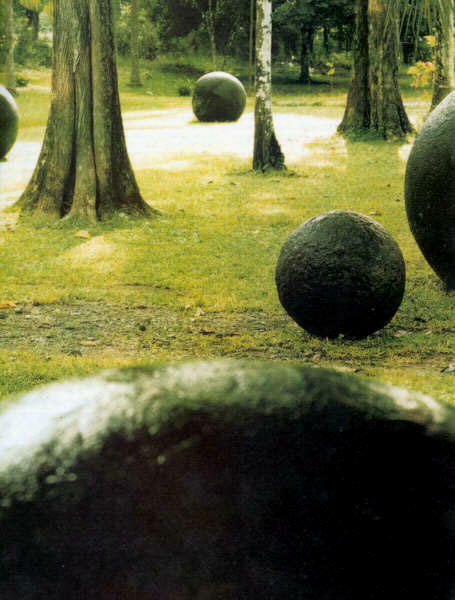 Their sizes are not achieved naturally; in fact there are clear clues which suggest that the stone balls were made by humans.